For thousands of years, if you’ve wanted to find the truth, you’ve gone to the wilderness. The desert has been a place of either meditation or trial in so many cultures around the world. It seems that the wild outdoors, the untamed world outside of human control, still has a strange power over the human mind. Something happens when you let go of your routines and comforts and expose yourself to the raw wilderness of the created world. I’m thinking of all the people who’ve chosen the monastic life. The Desert Fathers and Mothers of the first Christian centuries. Or I’m thinking of the adventurers. The mountaineers. The people running ultra marathons in the Namib desert. The sailors. The hikers.The people who love the wilderness. I’m willing to bet that there’s a part of the adventurer in all of us. We travel to distant places, seeking landscapes that somehow… pierce us, don’t we? I know this is why I love sailing. The sea makes you feel so… small. Under the vast sky, in the middle of the huge sea, things suddenly seem to be in the right proportions. I love to think that in the beginning of our history people were essentially outdoors - and naked. We were born in the wilderness, and very much exposed to it. The history of human civilisation is essentially about taming the wilderness. But it seems that there’s something in it that many of us still long for. Maybe Eldredge is right. Maybe there is something that can only be found in the wilderness. Your soul? Your heart? The truth, maybe. Maybe you need to peel away all the extra layers of your life to find out what really lasts and what doesn’t. Maybe we sometimes need to challenge ourselves, to test our survival in a way or another, to see what we’re made of. Maybe we sometimes need absolute silence and solitude to hear what our souls say. All this sounds very good, exciting and even noble. It’s cool to think of the people who can go mountaineering. I bet many of us would love to get away a bit more than we do. However, in these past weeks and months I’ve been thinking about a very different kind of a wilderness; the deserts that we sometimes do not choose but end up in, whether we wanted or not. When I started creating the Wilderness colourway I had no idea what it stood for. 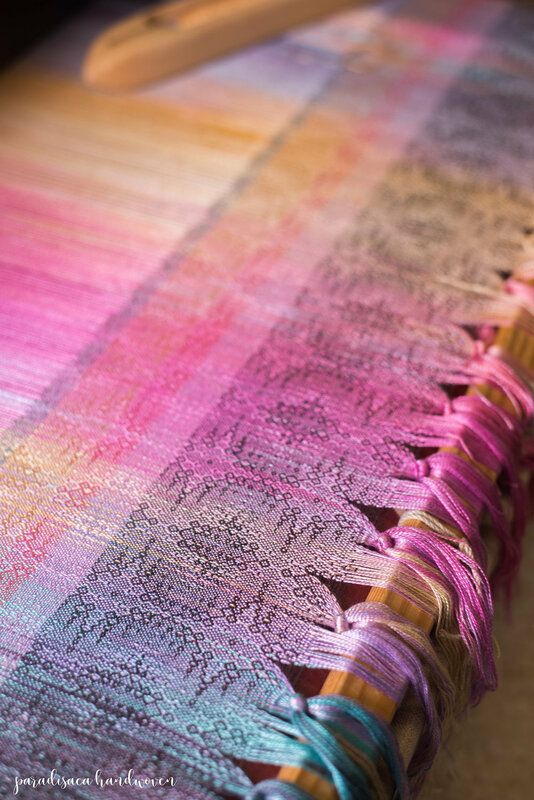 I worked in a very different way than before; I had a weft I needed a warp for, and I simply looked for colours that would fit it. Only afterwards did I start wondering what was their story. Quite soon, however, a word emerged. “The Wilderness”, I thought, and it felt fitting. It took me however several months to realise what the name stood for. The wilderness has for thousands of years been the place where you go to find the truth. Sometimes, however, you don’t choose to go yourself, but are simply thrown into the wilderness. There are two ways to learn truths about life, aren’t there? One way is to go after them, to look for answers, to educate yourself. The other is trough crisis. Sometimes we go to the wilderness to test ourselves. Sometimes we, however, simply find ourselves in a desert, and are tested without our consent. In several cultures the wilderness has also been a place of trial. And isn’t that true of life? There are many deserts we end up in; so many trials we end up in. Suddenly the maps of your life just go blank, and you’re left there in the unknown landscape, trying to navigate your way back home. Sometimes you’re pushed into a very real survival test, and it’ll really reveal what you are made of. As I’ve been working with The Wilderness I have especially thought about all the people - mothers, caregivers - who know the desert called depression. Or post-partum depression. This spring I’ve been dealing with my third round of PPD. Being a mother to Auri has proved that postpartum mood changes seem to be a price that I pay of being a mother. The same has happened each time I’ve weaned a child; my system simply goes funny with the hormonal changes and with the inevitable tiredness. It’s a strange, strange thing. You’re in a moment in your life when you know you should be happy, and you genuinely want to be happy, and you ARE happy - and then your brain just sort of backfires and does all kinds of strange things, completely regardless of your actions. I decided I wanted to be open about this; I believe we should talk more about these things. The biggest trap in any depression can be the feeling of isolation, the thought that you’re somehow lost inside of yourself and the feeling that you have lost all connection to others. Loneliness can be the ultimate desert. But - no-one is really alone. Some estimates say approximately 10-15% of women suffer from some kind of PPD. In a group as big as this chatter that’d be 140-210 people. It’s a big desert. If you start to notice that there are others there too - that you’re not the only one in the landscape - the journey becomes so much easier. One of the big problems in PPD can be the guilt (“what am I doing wrong, I should be happy, will my child notice I’m not well, will this damage them, why on earth can I not just get a grip”), but if you realise that this is just something that happens to you and you’re not alone, you actually can find your way out. Speaking helps, getting it all out of your system. However, post-partum depression is just one kind of a desert. There are so many different wildernesses we may end up in. During these spring months I’ve found courage especially in one thought. What if you always will, eventually, find something in the wilderness? What if there always is something there that you couldn’t find otherwise? What if this is true even when you’re pushed to the wilderness against your will? The wilderness has a way of revealing what is real and what is not. Maybe, in the end, after the rough journey, we actually will be richer. It doesn’t feel like it when you’re still marooned in the desert, but what if it is true? The Wilderness colourway is a picture of a blooming desert; a symbol of the hope that no matter how rough the landscape may look like, a million seeds sleep in the sand.